In the period immediately following the assassination of General Rafael Trujillo, known as “El Jefe,” the Dominican Republic was in shambles. The nation was under the control of a three-man junta which, with the help of the United States, was preparing for presidential elections. 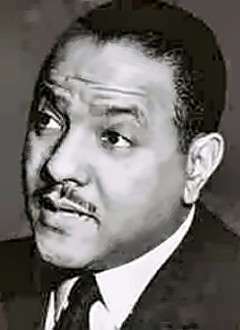 In 1963, Juan Emilio Bosch Gaviño was elected President of the Dominican Republic; that same year, only a few months after his inauguration, he was ousted from the government by the Dominican military that later established another three-mean junta in Bosch’s place. 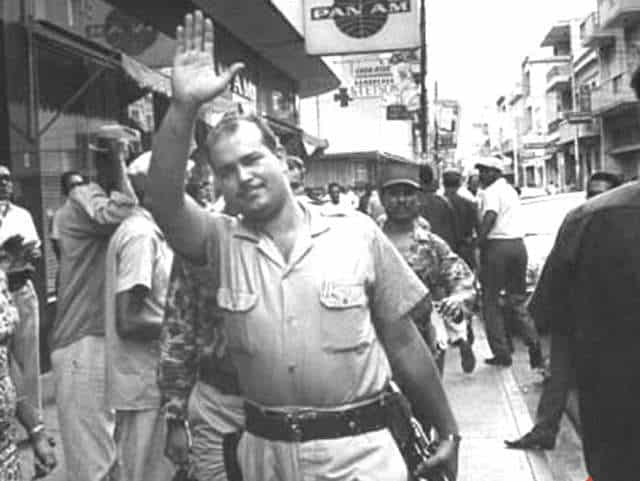 In 1965, Francisco Alberto Caamaño Deñó led what was known as the Caamaño Revolt, the opening salvo in the Dominican Civil War. Made famous by the violence that ensued in the streets of Santo Domingo, the Caamaño movement aimed to restore Juan Bosch as President, and return the Dominican Republic to a constitutional democracy. 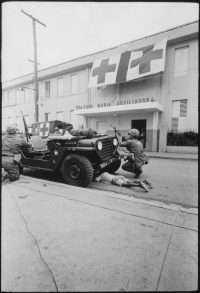 The Caamaño revolt resulted in the deployment on April 28, 1965 of U.S. Marines and troops from the Organization of American States (OAS) to the Dominican Republic to restore peace and stability. The American intervention lasted until September 1966. While Bosch did not return to the presidency, the movement ended with the inauguration of Hector Garcia-Godoy as the Provisional President, who is now remembered for his pivotal role in the return of democracy on the island, and his hand in organizing the 1966 elections. VALLIMARESCU: In the Dominican Republic it was a very interesting period because we had broken relations with the Dominican Republic during the last year of Trujillo who had been assassinated a year before I arrived. The country was being run by a civilian junta headed up by a very distinguished elderly gentleman, a lawyer, [Rafael Filiberto] Bonnelly, and they were getting ready, presumably, to have elections. Our Ambassador, John Bartlow Martin, was a writer and journalist of sorts from Chicago, a political appointee and a decent gentleman, but he didn’t know much about the outside world, really. The principal issue during my first few months there was the election issue because the Ambassador and Washington wanted to have free, democratic, U.S.-style elections in the Dominican Republic immediately, if not sooner. I took a different position in writing and orally. I said, “These people are 75 percent illiterate. They’ve had 40 years of brutal dictatorship. They don’t know what it means to have a free election. Why don’t we let this junta, which is a decent, civilized junta, stay in power for a while and we help build up the institutions, help them economically, educate them a bit? You’re going to have an election overnight? They don’t know what it means. They’ll vote for anybody.” But I did not prevail. So we put out comic books about how to vote, pamphlets on voting procedures, etc. We had an election and Mr. Juan Bosch (in photo) was elected president of the Dominican Republic – someone I never trusted. Mr. Bosch, after he had been elected, left the country for a while. He took office about two months later. He went on a trip and came back two days before his inauguration. He was supposed to be met triumphantly at the airport, but there was such a mob scene they decided to take him by helicopter to the headquarters of the Dominican radio and television studios where he would make a speech to the people. Alice and I had in our house three American journalists from the 50 or so who had come for the inauguration. One was Phil Geyelin, who was then with the Wall Street Journal, and who later became head of the editorial page of the Washington Post. Another was Bob Novak and the third I don’t remember. None of them spoke Spanish. 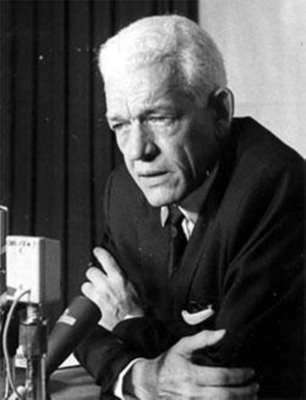 We decided to sit down by the pool in front of the television set and hear Juan Bosch’s speech. I didn’t interpret as it went along; I told them I’d give them a summary at the end. “I’d say maybe eight months or so.” Well, after nine months he was overthrown. To this day, Bob Novak and Phil Geyelin remember that I gave them a scoop. Obviously they didn’t quote me, but they wrote that well-informed observers felt that Mr. Bosch was not going to last out his term of office or maybe not even one year. I said, “No, sir, he’s not. I know him better than you do.” The Ambassador used to send me on missions to Bosch and I knew from friends that he made fun of the Ambassador and of the United States in his intimate circle. Obviously they didn’t rise up in arms. The worse part was that we suspended aid and withdrew our massive AID [Agency for International Development] mission that we had there. Again this was a tragic mistake and I fought against it because once you withdraw these 50, 60 people and destroy the infrastructure, to start up any aid program again would take months and months. So we really had no diplomatic relations with them. When Kennedy was assassinated, we were in Santo Domingo and the embassy organized a service at the Cathedral. The entire three-man junta, all of whom were personal friends of mine and very decent people — one of whom was Foreign Minister again until recently — were all there at the church. They paid their respects to the Chargé and to all of us. I reported on this to Spencer King. Johnson did decide. It was one of his first moves to renew relations with the Dominican Republic and to resume aid. Obviously the aid program was taking a long time to make its effect. By 1965, I wasn’t there any more, the situation had deteriorated to such a point that you had the Caamaño (in photo) revolt, and we had to send in the Marines…. 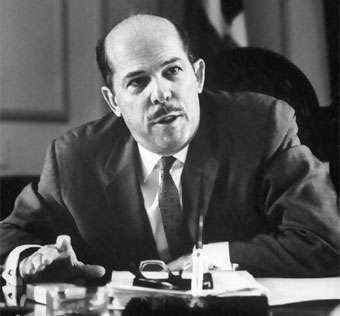 So Johnson becomes President and one of his first appointments was Tom Mann as Assistant Secretary for Inter-American Affairs. I had been in the Dominican Republic for a year and a half when I got a phone call from Tom Mann, saying, “Val, I want you back here in Washington to be public affairs adviser in ARA [Bureau of Inter-American Affairs].” “All right, you’re the boss.” So we left the Dominican Republic a year and a half before we should have and I was back in Washington as public affairs adviser to Tom Mann, on loan from USIA. We are talking ’63 to ’66. I said, “Yes, Mr. Secretary, by all means I would. But we should have OAS [Organization of American States] participation.” This was the consensus. He said that they wanted me down there and to leave that afternoon. I said, “There’s Mrs. Visoianu who was working at the Voice [of America].” “Well, we’ll get the Voice to release her for as long as necessary.” Well, Mrs. Visoianu didn’t feel she could do it. But there was another Romanian lady who was contacted. I didn’t see my boys that day; I left at 4 o’clock before they came back from school. I left them a note. We took off at 5 o’clock in the afternoon and arrived in Santo Domingo. I remember we were in a helicopter with the door open and Marines with sub-machine guns pointed at the ground. We heard shooting all over the place. We landed on the embassy residence grounds. I found total mayhem and chaos. The Marines had established a security perimeter around Santo Domingo and the Commander-in-Chief of the combined forces was General Palmer. Our Ambassador was Tap Bennett. My job, of course, was to brief the press every day – the 4 o’clock follies. The whole situation was so nightmarish and I didn’t do very well. I was greatly pre-occupied about Alice, whose mother had died in the meantime. She never made it in time to see her. The children were alone. My main problem was that I couldn’t get information. I couldn’t get General Palmer or Tap Bennett to tell me what they were up to. I said, “Well, people who shoot at you are generally not your friends.” They liked that. Anyway, the first two briefings were all right, pretty good. But then they started expanding the security perimeter without telling me, the press spokesman. Then statements were made in Washington by President Johnson that the Caamaño people were murdering civilians right and left, and the streets of Santo Domingo, or the sector controlled by them, were littered with corpses. They gave out, in Washington, lists of names of people who had been killed, executed. They gave out, without my knowing, lists of Cuban agents who had been identified and who were with Caamaño. I remember I was faced by questions: Is it true that the streets of Santo Domingo are littered with corpses? Is it true that the Cuban agents — and so on. This was the first I had heard that this statement had been made by the White House. Nobody would tell me. You can imagine what it is to brief journalists who are more informed about what’s going on than you are. “Wha, wha, what? What perimeter?” I had been in the residence with General Palmer and at General Palmer’s headquarters, and they never told me. I told Washington to tell them to keep me informed or I would give up. So about the fourth day I was a nervous wreck and had a briefing session. I am informed that, in order to help me, John King would come from the State Department. John King was then working for the Assistant Secretary for Public Affairs, and he came down to help me. I remember I was in a building where I had temporary offices, and John arrived looking perfectly neat with tie and coat, very distinguished looking. He sat down at a desk before an open window. I was a nervous wreck. We get down to the briefing, and I must say I couldn’t cope with it – although people who saw it on television said I did well. I couldn’t cope with it. John King was sitting there and I said, “I’m sorry, ladies and gentlemen, but Mr. King is going to take over.” I had no more briefings after that and I went back. Hew Ryan came down. He was then the USIA [U.S. Information Agency] area director of Latin America. It was not one of my better moments. Although Bruce Van Voorst in Newsweek had some words of praise for me – but that was in the very beginning – but said, in effect, that it was quite obvious that Val, who is a good professional and a man who is respected by all the press, really was not informed as to what was going on. Q: Why didn’t they inform you? Why didn’t they keep you up to date? VALLIMARESCU: I don’t know. I really don’t know. Looking back on it, Palmer, as a military man, considered all these movements’ military movements, not to be known to the press. And Tap Bennett, largely because he had lost control of the situation was scared, panicked and couldn’t focus on this very important priority. And also the problem was that things were being done in Washington. Johnson wanted to prove something – wanted to prove that this was Cuban originated, wanted to prove that Camaaño was a real SOB and was murdering people – and they released things that could not be checked on. Some of the supposed Cuban agents were nonexistent or were dead. Q: Where was the White House getting its information? VALLIMARESCU: From the other agency [CIA], I guess. I don’t know. It was a mess. It was a mess. But I do remember there was one positive thing to it — it was not all negative. There was a man named Hector Garcia Godoy. 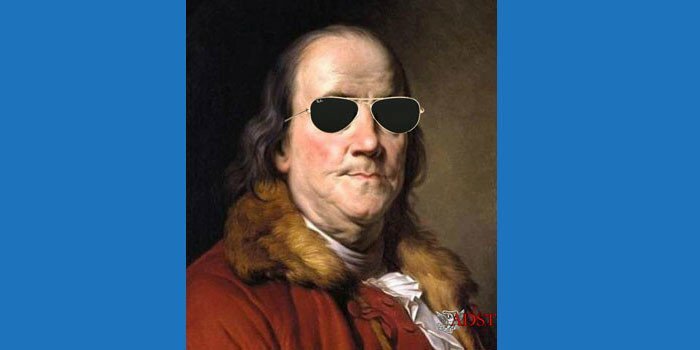 The important thing was that once the Camaaño thing was almost finished – the military operation was fairly successful – we and others were looking for someone to become president of the Dominican Republic. Someone with good credentials, someone honest, a man of integrity. The one man whose name came up most often was Hector Garcia-Godoy, whom we had known very, very well. He had been Ambassador to London and came back to the Dominican Republic to have a big job in the Foreign Office when we were there in our previous incarnation. Hector lived across the street from what had been my residence when I was PAO [Public Affairs Officer] and which was my residence this time. After I gave up on the press briefings, after five days, I stayed on for another four or five days. Hew Ryan was there and he gave me some assignments, writing stuff. So, Hector Garcia-Godoy lived across the street. One night I went over there, dropped in uninvited. He gave me a big abrazo [hug] and we spoke for three or four hours. He was very reluctant. He didn’t know if he could carry it off. I think I helped there because he did accept the presidency. He was Ambassador to Washington after that and later he died of cancer. As a matter of fact, I saw his widow when I got married to Barbara in the Dominican Republic; I saw his widow and his brother-in-law. So, anyway, that was one positive aspect of my rather nightmarish visit during that period: I think I helped convince Hector Garcia-Godoy to become President of the Dominican Republic.